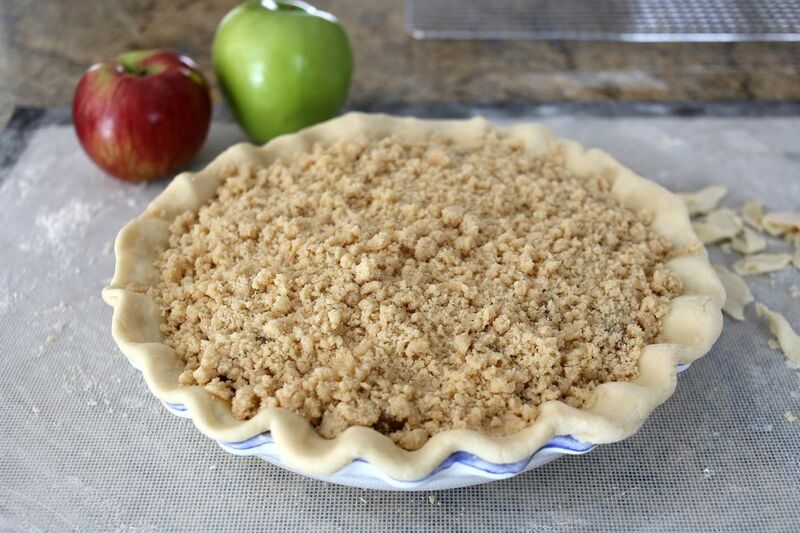 Apple pies can seem like a daunting task, especially for beginners, but it doesn't have to be! Instead of worrying about making an award-winning top pie crust, take a more accessible approach. This incredibly delicious apple crisp pie is made with fresh apples and a crunchy oat and pecan streusel topping. While the crunchy topping is amazing, we really love that this pie has no need to fuss with a top crust. You just roll out the bottom crust—whether you use a store-bought frozen or refrigerated crust—and then mix the topping and sprinkle it over the apples. Easy-peasy! Peel the apples; core them and cut into thin slices. Toss the sliced apples in a bowl with lemon juice to keep them from browning. Add 1/2 cup sugar and the brown sugar, 1/4 cup melted butter, flour, and spices. Stir until mixture is well blended. Prepare the pie pastry; fit into a pie plate and set aside. In a large bowl, combine the topping ingredients; blend with a pastry blender, two forks, or your fingers. Alternatively, pulse the ingredients a few times in a food processor. Pour the apple mixture into the prepared pie shell. Sprinkle the topping mixture evenly over top of apples. Bake the pie in the preheated oven for about 45 to 60 minutes, until apples are tender and topping is browned. Check after about 30 to 35 minutes to make sure the crust isn't getting too brown. Use a pie shield or homemade ring of foil to protect the crust edge if necessary.